and that’s the driving force behind the SHAW lens. This month, the College of Optometrists in Vision Development published a new study in their journal, Optometry & Vision Development, which demonstrates a case where successful treatment of amblyopia was achieved without patching using the methodology behind the SHAW lens. 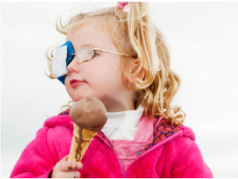 For years the prescribed treatment for amblyopia has been to artificially suppress the dominant or “good” eye using a patch or Atropine drops. But the efficacy of this has always been questionable. In some instances patching can train the weaker eye to engage, but not without undue strain on the patient – especially when the patient is young. And because patching is a monocular approach, oftentimes there are no long-term positive effects. 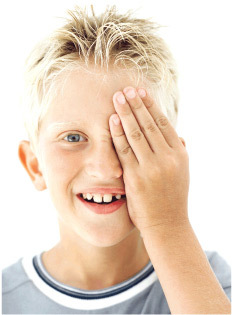 “Occlusion therapy or patching a child’s good eye for hours at a time is now an “old school” approach,” says Dr. Peter J. Shaw OD, and co-founder of Shaw Lens Inc. “It is, in some ways, cruel and it does not address the underlying cause which is the lack of binocular (two-eyed) vision development. With lenses to treat amblyopia, one lens will be thicker that the other. However, you may be surprised to see that it is the weaker lens that is thicker! 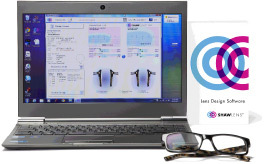 Lens magnification is created by a combination of the shape/thickness and the dioptric power. We can’t reduce the power so we optimize the shape to compensate optically. This results in the weaker lens being thicker to balance image size. 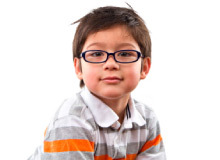 Parents who are presented with the option to treat their child’s amblyopia are generally unconcerned with the lens thickness, especially when compared to patching. Because of the difference in lens thickness, we recommend a Zyl edge frame so that the difference is not visible. The extra thickness is absolutely normal, and at the end of the day, we now have a patient without amblyopia and without using patching! This 4-year-old presented without previous spectacle correction and had complaints of blurred vision in the right eye. At the time of the initial examination, acuities with correction were OD 20/100, OS 20/20, stereo acuity distance 360”. There was no evidence of strabismus. Because of the age of the child, and the condition itself, it was difficult to get accurate motor fusion limits. Using the SHAW lens treatment plan, an iseikonic correction of 0% was prescribed. The image above shows the difference between a conventional 1.6 lens and the SHAW lens. The darker blue indicates the binocular field of view. This patient’s parents ordered an additional pair of glasses from an online optical supplier. The child put them on and then just took them off, saying, “I can’t wear those.” The refractive prescription was correct and the PD was supplied as requested. The traditional lenses failed to correct the static and dynamic components of the anisometropia, and the child immediately found the traditional lenses to be unwearable. The optometrist refracts the patient as per usual and takes the frame and position of wear measurements. Complete order using the SHAW lens design tool. Assess after 12 weeks of full time wear. Our promise to the patient: You shouldn’t have to adapt to a SHAW lens. In fact, if you don’t think your SHAW lenses are the best you’ve worn from the minute you put them on – then we’ll make it right or give you a full refund. It’s that simple. Please make any claims within 90 days of receipt of lenses.